For Midler's 1973 album, see Bette Midler (album). Bette Midler (/bɛt/; born December 1, 1945) is an American singer, songwriter, actress, comedian, and film producer. Since 1970, Midler has released 14 studio albums as a solo artist. Throughout her career, many of her songs became hits on the record charts, including her renditions of "The Rose", "Wind Beneath My Wings", "Do You Want to Dance", "Boogie Woogie Bugle Boy", and "From a Distance". In 2008, she signed a contract with Caesars Palace in Las Vegas to perform a show titled Bette Midler: The Showgirl Must Go On, which ended in 2010. Midler made her motion picture debut in 1979 with The Rose, which earned her a Golden Globe for Best Actress, as well as a nomination for the Academy Award for Best Actress. She has since starred in a number of hit films, which include: Down and Out in Beverly Hills (1986), Ruthless People (1986), Outrageous Fortune (1987), Big Business (1988), Beaches (1988), Hocus Pocus (1993), The First Wives Club (1996), The Stepford Wives (2004), and Parental Guidance (2012). She also starred in For the Boys (1991) and Gypsy (1993), winning two additional Golden Globes for these films and receiving a second Academy Award nomination for the former. In a career spanning almost half a century, Midler has won three Grammy Awards, four Golden Globes, three Emmy Awards, and a Tony Award. She has sold over 30 million records worldwide, and has received four Gold, three Platinum, and three Multiplatinum albums by RIAA. Midler's latest work included appearing on Broadway in a revival of Hello, Dolly!, which began preview performances on March 15, 2017 and premiered at the Shubert Theatre on April 20, 2017. It was her first leading role in a Broadway musical. On June 11, 2017, Midler received the Tony Award for Best Actress in a Musical for the title role in Hello, Dolly!. 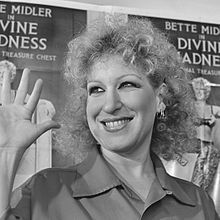 Bette Midler was born in Honolulu, where her family was one of the few Jewish families in a mostly Asian neighborhood. Her mother, Ruth (née Schindel), was a seamstress and housewife, and her father, Fred Midler, worked at a Navy base in Hawaii as a painter, and was also a housepainter. Both parents were born in New Jersey. She was named after actress Bette Davis, though Davis pronounced her first name in two syllables, and Midler uses one. She was raised in Aiea and attended Radford High School, in Honolulu. She was voted "Most Talkative" in the 1961 school Hoss Election, and "Most Dramatic" in her senior year (class of 1963). Midler majored in drama at the University of Hawaii at Manoa but left after three semesters. She earned money in the 1966 film Hawaii as an extra, playing an uncredited seasick passenger named Miss David Buff. Midler relocated to New York City in the summer of 1965, using money from her work in the film Hawaii. She studied theatre at HB Studio under Uta Hagen. She landed her first professional onstage role in Tom Eyen's Off-Off-Broadway plays in 1965, Miss Nefertiti Regrets and Cinderella Revisited, a children's play by day and an adult show by night. From 1966 to 1969, she played the role of Tzeitel in Fiddler on the Roof on Broadway. After Fiddler, she joined the original cast of Salvation in 1969. Midler released her debut album, The Divine Miss M, on Atlantic Records in December 1972. The album was co-produced by Barry Manilow, who was Bette's arranger and music conductor at the time. 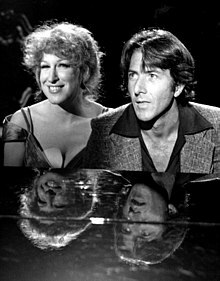 It reached Billboard's Top 10 and became a million-selling Platinum-certified album, earning Midler the 1973 Grammy Award for Best New Artist. It featured three hit singles—"Do You Wanna Dance? ", "Friends", and "Boogie Woogie Bugle Boy"—the third of which became Midler's first No. 1 Adult Contemporary hit. "Bugle Boy" became a successful rock cover of the classic swing tune originally introduced and popularized in 1941 by the Andrews Sisters, to whom Midler has repeatedly referred as her idols and inspiration, as far back as her first appearances on The Tonight Show Starring Johnny Carson. Midler told Carson in an interview that she always wanted to move like the sisters, and Patty Andrews remembered: "When I first heard the introduction on the radio, I thought it was our old record. When Bette opened at the Amphitheater in Los Angeles, Maxene and I went backstage to see her. Her first words were, 'What else did you record?'" During another Midler concert, Maxene went on stage and presented her with an honorary bugle. Bette recorded other Andrews Sisters hits, including "In the Mood" and "Lullaby of Broadway". Midler worked on the troubled comedy project Jinxed! in 1981. However, during production, there was friction with co-star Ken Wahl and the film's director, Don Siegel. Released in 1982, the film was a major flop. Midler did not appear in any other films until 1986, however, she was an early choice for Miss Hannigan in the 1982 film Annie. During those four years, she concentrated on her music career and in 1983, released the album No Frills, produced by Chuck Plotkin, who was best known for his work with Bob Dylan and Bruce Springsteen. The album included three single releases: the ballad "All I Need to Know", a cover of Detroit native Marshall Crenshaw's "You're My Favorite Waste of Time"—which Midler fell in love with after flipping his 45 of "Someday Someway"—and Midler's take on the Rolling Stones cover "Beast of Burden". She also released an all-comedy album (with a few songs tied into the comedy) called "Mud Will Be Flung Tonight" in 1985. Midler performed on USA for Africa's 1985 fund-raising single "We Are the World", and participated at the Live Aid event at JFK Stadium in Philadelphia. Also in 1985, she signed a multi-picture deal with the Walt Disney Studios, where she starred in a string of successful films produced by the studio's newly formed Touchstone Pictures division. She also produced them through her production banner, All Girl Productions with producing partner Bonnie Bruckheimer. She was subsequently cast by director Paul Mazursky in Down and Out in Beverly Hills, beginning a successful comedic acting career. She followed that role with several more Touchstone comedies, Ruthless People (1986), Outrageous Fortune (1987), and Big Business (1988). Later in 1988, Midler lent her voice to the animated character Georgette, a snobbish poodle, in Disney's Oliver & Company, and had a hit with the tearjerker Beaches, co-starring Barbara Hershey. The accompanying soundtrack remains Midler's all-time biggest selling disc, reaching No. 2 on Billboard's album chart and with U.S. sales of four million copies. It featured her biggest hit, "Wind Beneath My Wings", which went to No. 1 on Billboard's Hot 100, achieved Platinum status, and won Midler her third Grammy Award – for Record of the Year – at the 1990 telecast. After nearly three decades of erratic record sales, Midler was dropped from the Warner Music Group in 2001. Following a reported long-standing feud with Barry Manilow, the two joined forces after many years in 2003 to record Bette Midler Sings the Rosemary Clooney Songbook. Now signed to Columbia Records, the album was an instant success, being certified gold by RIAA. One of the Clooney Songbook selections, "This Ole House", became Midler's first Christian radio single shipped by Rick Hendrix and his positive music movement. The album was nominated for a Grammy the following year. Midler joined forces again with Manilow for another tribute album, Bette Midler Sings the Peggy Lee Songbook. Released in October 2005, the album sold 55,000 copies the first week of release, returned Midler to the top ten of US Billboard 200, and was nominated for a Grammy Award. In June 2012, Midler received the Sammy Cahn Lifetime Achievement Award at the Songwriters Hall of Fame in New York in recognition of her having "captivated the world" with her "stylish presentation and unmistakable voice." The same year, she co-starred alongside Billy Crystal in the family movie Parental Guidance (2012), playing a couple of old school grandparents trying to adapt to their daughter's 21st-Century parenting style. Despite generally negative reviews by critics, who felt the film was "sweet but milquetoast", box office totals for the movie were higher than initially expected. In 2013, Midler performed on Broadway for the first time in more than 30 years in a play about the Hollywood superagent Sue Mengers. The play, titled I'll Eat You Last: A Chat with Sue Mengers and dramatized by John Logan, opened on April 24, 2013 at the Booth Theatre. After the show's success in New York, recouping its initial $2.4 million investment, it was decided to perform the play in Los Angeles at the Geffen Playhouse. In December, it was announced that Midler would portray actress Mae West in an HBO movie biopic, written by Harvey Fierstein and directed by William Friedkin. In March 2014, she performed at the 86th Academy Awards telecast at the Dolby Theatre in Los Angeles, singing "Wind Beneath My Wings" during the in memoriam section. In November 2014, Midler released her 25th overall album, It's the Girls!, through Warner Bros. Records. The album spans seven decades of famous girl groups, from 1930s trios The Boswell Sisters and The Andrews Sisters to 1990s R&B legends such as TLC and their single "Waterfalls". In March 2017, she began playing the role of Dolly Gallagher Levi, continuing through January 2018, in the Broadway revival of Hello, Dolly! for which she won her second Tony Award. In 2017 she also appeared in the role of Muv in the 2017 film Freak Show. On April 20, 2018 it was announced that Midler will be returning to Hello, Dolly! on July 17 to close out the run of the successful revival. Midler performed the song, The Place Where Lost Things Go from Mary Poppins Returns at the 91st Annual Academy Awards in February 24, 2019 ceremony. In 1991, Midler was an early sponsor of the Adopt-a-Highway, paying $2,000 a month for a crew to clean up a 2-mile section of the Ventura Freeway in Burbank, California. Signs at both ends of the section read "Litter Removal Next 2 Miles, Bette Midler." The location was so prominent that it became fodder for her 1993 guest appearance on the Simpsons episode "Krusty Gets Kancelled", where she is seen picking up trash along a stretch of highway she has adopted, and causes car crashes for drivers who deliberately litter. In 1995, she carried the same idea to the east coast, adopting a section of the Long Island Expressway and Bronx River Parkway. In 2001 after 9/11, she established programs run by her foundation which helps wounded service members and their families by providing them resources, including custom homes. One of these programs helps service members recovering from trauma, injury and loss. Also, ever since the first Gulf War she goes to the USO and on bases to show her gratitude to military members by serving them meals just before deployment. 1999 Fantasia 2000 Herself / Hostess Segment: "Piano Concerto No. 2, Allegro, Opus 102"
1993 The Simpsons Herself Voice role; "Krusty Gets Kancelled"
1997 The Nanny Herself "You Bette Your Life"
1998, 2018 Murphy Brown Caprice Morton (née Feldman) "Never Can Say Goodbye"
1974: Received the Grammy Award for Best New Artist. 1974: Honored with the Special Award for adding lustre to the Broadway season by the Tony Awards. 1976: Honored as the Woman of the Year by the Hasty Pudding Theatricals. 1985, February 6: Inducted into the Hollywood Walk of Fame with a star for her contribution for Recording — 6922 Hollywood, Blvd. 1985: Honored with the Jack Oakie Comedy Award by the Women in Film Crystal + Lucy Awards. 1987: Received the American Cinematheque Award during the American Cinematheque Gala Tribute. 1987: Named Funniest Female Performer of the Year by the American Comedy Awards. 1987: Honored with the Lifetime Achievement Award in Comedy by the American Comedy Awards. 1987–88: Honored as the Favorite All-Around Female Entertainer by the People's Choice Awards. 1988: Honored as the Female Star of the Year by the ShoWest Convention. 1996: Named Female Star of the Year with Diane Keaton and Goldie Hawn for 'The First Wives Club' by the Golden Apple Awards. 1997: Honored with the Crystal Award by the Women in Film Crystal + Lucy Awards. ^ "Bette Midler Biography (1945-)". FilmReference.com. Retrieved December 10, 2013. Source notes: "Born December 1, 1945, in Paterson, NJ (some sources cite Honolulu, HI or Aiea, HI); raised in Aiea, HI". ^ Sinead Garvan (November 26, 2010). "Bette Midler: I wouldn't make it now". BBC News. Retrieved July 25, 2011. ^ "Gold & Platinum Searchable Database - August 01, 2014". RIAA. Retrieved August 1, 2014. ^ "The Religious Affiliation of Singer, Actress, Comedian Bette Midler". Adherents.com. October 8, 2005. Retrieved July 25, 2011. ^ "Bette Midler, Biography (1945–)". FilmReference.com. Retrieved July 28, 2011. ^ "Bette Midler: The Divine Miss Bubbe". Jewish Journal. December 12, 2012. Retrieved December 18, 2012. ^ "Bette Midler". Jewish Women's Archive. Retrieved July 25, 2011. ^ a b Richard Corliss (March 17, 2004). "That Old Feeling: Best Bette Yet". Time. Archived from the original on February 21, 2011. Retrieved July 25, 2011. ^ "Bette Midler". BroadwayWorld.com. Retrieved July 28, 2011. ^ "Bette Midler". Houston Voice. DelveIntoTheDevine.com. October 23, 1998. Archived from the original on March 13, 2012. Retrieved July 28, 2011. ^ Melinda Bargreen (July 22, 2005). "Glynn Ross, 90, turned Seattle into opera destination". The Seattle Times. Seattletimes.com. Archived from the original on May 24, 2011. Retrieved July 25, 2011. ^ a b c d "Gold & Platinum Searchable database-Bette Midler". Recording Industry Association of America. Retrieved July 28, 2011. ^ a b c "Past Winners Search-Midler". Grammy.com. Retrieved July 28, 2011. ^ "Bette Midler". Emmys.com. Retrieved December 18, 2012. ^ "Thighs and Wispers". betteontheboards.com. Archived from the original on July 17, 2011. Retrieved July 25, 2011. ^ "Bette Midler". Box Office Mojo. Box Office Mojo. Retrieved April 13, 2015. ^ "'We Are The World' Tune Brings Out The Best of America's 46 Stars". Jet. Google Books. February 18, 1985. p. 16. Retrieved July 28, 2011. ^ Maslin, Janet (February 2, 1990). "MOVIE REVIEWS : Melodrama: Was this 'Stella,' a loony Midler remake, really necessary?". Los Angeles Times. Retrieved June 10, 2012. ^ "Stella". Chicago Sun Times. Retrieved June 10, 2012. ^ Broeske, Pat H. (February 26, 1991). "THREE-DAY WEEKEND BOX OFFICE : A Replay of the Top Fhree". Los Angeles Times. Retrieved June 10, 2012. ^ Canby, Vincent (February 22, 1991). "Review/Film; A Marriage On and Off The Rocks". The New York Times. Retrieved June 10, 2012. ^ "Scenes from a Mall". Chicago Sun-Times. Retrieved June 10, 2012. ^ Rainer, Peter (February 22, 1991). "MOVIE REVIEW : Down and Out in Beverly Center : A Slice of L.A.--Without the Bite". Los Angeles Times. Retrieved June 10, 2012. ^ Lynn Hirschburg (October 8, 2000). "Meta-Midler". New York Times. p. 14. Retrieved July 25, 2011. ^ Bill Saporito (March 31, 2003). "Great Performances to Savor". Time. Retrieved July 25, 2011. ^ "Five Reasons Why 'Hocus Pocus' is One of the Greatest Cult Classic Films". International Business Times. Retrieved November 3, 2011. ^ "ABC Family's "13 Nights of Halloween 2011" Scares Up Record Crowd". TV By the Numbers. Archived from the original on November 6, 2011. Retrieved November 3, 2011. ^ "HOCUS POCUS – Where are they now?". Oh No They Didn't. Archived from the original on November 3, 2011. Retrieved November 3, 2011. 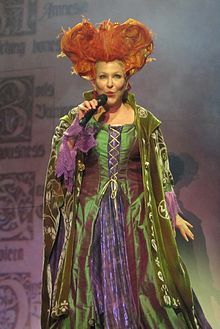 ^ "Bette Midler's Hulaween Party to Celebrate 20th Anniversary: See Her Best Costumes!". Us Weekly. Retrieved November 3, 2015. ^ a b "CBS Reportedly Cancels 'Bette'". ABC News. ABC News. March 6, 2001. Retrieved February 18, 2010. ^ a b McCarthy, Todd (December 10, 2000). "What Women Want review". Variety. Retrieved October 1, 2012. ^ Kaufman, Amy (January 1, 2010). "No Complications For Meyers". Los Angeles Times. Retrieved February 18, 2010. ^ "Isn't She Great (2000)". RottenTomatoes. RottenTomatoes.com. Retrieved October 1, 2012. ^ "Drowning Mona (2000)". RottenTomatoes. RottenTomatoes.com. Retrieved October 1, 2012. ^ "The Stepford Wives (2004)". Boxofficemojo.com. Retrieved September 20, 2010. ^ "Stepford Wives 2004 budget details". The Numbers. Retrieved September 20, 2010. ^ "Sings the Peggy Lee Songbook-Bette Midler". Billboard. Retrieved July 28, 2011. ^ "Bette Midler's Array of Awards". Bootleg Betty. Retrieved July 25, 2011. ^ John Katsilometes (November 5, 2009). "Bette Midler's residency at Caesars Palace to end Jan. 31". Las Vegas Sun. lasvegassun.com. Retrieved July 25, 2011. ^ "Bette Midler: The Showgirl Must Go On". Emmys.com. Retrieved December 18, 2012. ^ "Bette Midler – Jackpot: The Best Bette". charts.us. Retrieved July 25, 2011. ^ Robin Duke (December 8, 2009). "The Royal Variety Performance". The Stage. Retrieved July 25, 2011. ^ "Cats & Dogs: The Revenge of Kitty Galore (2010)". Box Office Mojo. October 21, 2010. Retrieved December 18, 2012. ^ Andrew Gans (February 28, 2011). "Priscilla Queen of the Desert Kicks Up Its Heels on Broadway Starting Feb. 28". Playbill. Archived from the original on July 31, 2011. Retrieved July 28, 2011. ^ "BBC News – Bette Midler to receive Songwriter Hall Of Fame award". Bbc.co.uk. March 8, 2012. Retrieved December 18, 2012. ^ "Parental Guidance (2012)". Box Office Mojo. Retrieved December 1, 2016. ^ Eric Shorey (December 11, 2013). "Bette Midler To Star As Mae West In HBO Movie Written By Harvey FiersteinNewNowNext". Newnownext.com. Retrieved August 1, 2014. ^ "Bette Midler To Perform On The Oscars®". Oscars.org. August 24, 2012. Retrieved August 1, 2014. ^ Guerra, Joey (April 28, 2014). "Multitalented Bette Midler has all kinds of plans for the future". Houston Chronicle. Retrieved August 1, 2014. ^ Peikert, Mark (February 17, 2019). "Bette Midler Will Perform on the Academy Awards". Playbill. Retrieved February 19, 2019. ^ "BetteBack: Midler Begins Adopt-A-Highway". BootLeg Betty. April 29, 2010. Retrieved December 1, 2016. ^ Russo, Tom (June 16, 1995). "Bette Midler has adopted-a-highway". EW.com. Retrieved December 1, 2016. ^ a b "About NYRP". New York Restoration Project. Retrieved July 25, 2011. ^ "Bette Midler". IMDb. Retrieved October 9, 2018. ^ League, The Broadway. "Bette Midler – Broadway Cast & Staff | IBDB". www.ibdb.com. Retrieved October 9, 2018. ^ "1st Annual Film Awards (1996) - Online Film & Television Association". www.oftaawards.com. Retrieved October 9, 2018. ^ "5th Annual TV Awards (2000-01) - Online Film & Television Association". www.oftaawards.com. Retrieved October 9, 2018. ^ "Bette Midler | Hollywood Walk of Fame". www.walkoffame.com. Retrieved October 9, 2018.